Kolkata, 25 January: POLICE this evening have arrested Naxalite party leader Sharmishta Choudhury (45), one of the key persons behind the mobilisation of villagers against an upcoming power transmission station on farmland at Bhangar in South 24-Parganas. 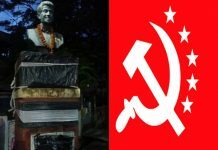 According to CPI-ML (Red Star) of which Sharmishta is a central committee member, she was picked up by a group of plain-cloth policemen from a street in south Kolkata. There were a few other leaders of her party with her at the time but they managed to give the police a slip. Sharmishta has since been taken to the New Town police station at Rajarhat near Kolkata and investigating officers were questioning her. She has been arrested on charges of inciting violence at villagers at Bhangar where two youths died on 17 January when police opened fire on villagers agitating against the power station. 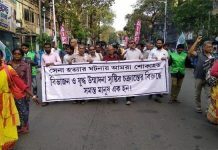 Sharmishta and her co-worker husband Alik Chakraborty had been campaigning at Bhangar until recently holding public meetings with villagers against the power station. With her being arrested, Chakraborty and other leaders of the CPI-ML (Red Star) have gone into hiding, although they are talking to media over phone. Reacting to Sharmishta’s arrest, villagers at Bhangar’s Khamarhait, Macchi Bhanga, Nutalhat and other areas have come out on the streets late this evening and have put up fresh blockades on the Haroa Road at several places by burning tyres and placing wooden logs. 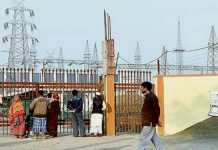 It was only yesterday that villagers had cleared the roads at Bhangar after near two weeks unrest on the assurance of Trinamool leader Mukul Roy that the power station would be rolled back if that was what the villagers wished. Subsequently, a large posse of police force marched through the Bhangar villages today. Accusing the police arresting Sharmishta without any valid charges, CPI-ML (Red Star) West Bengal state secretary Pradip Singh Thakur and CPI-ML (Liberation) state secretary Partha Ghosh have demanded her immediate release.